Pawlenty Truth-Teller Stance Echoes Another Minnesotan: Walter Mondale : It's All Politics Mondale, like Pawlenty, saw himself as delivering hard truths to voters in 1984. The former Democratic vice president tried to deny the Republican Reagan a second term by admitting he'd raise taxes to close yawning budget deficits. Reagan annihilated him. Walter Mondale was a presidential candidate who positioned himself as a truth-teller, and got his political clock cleaned. 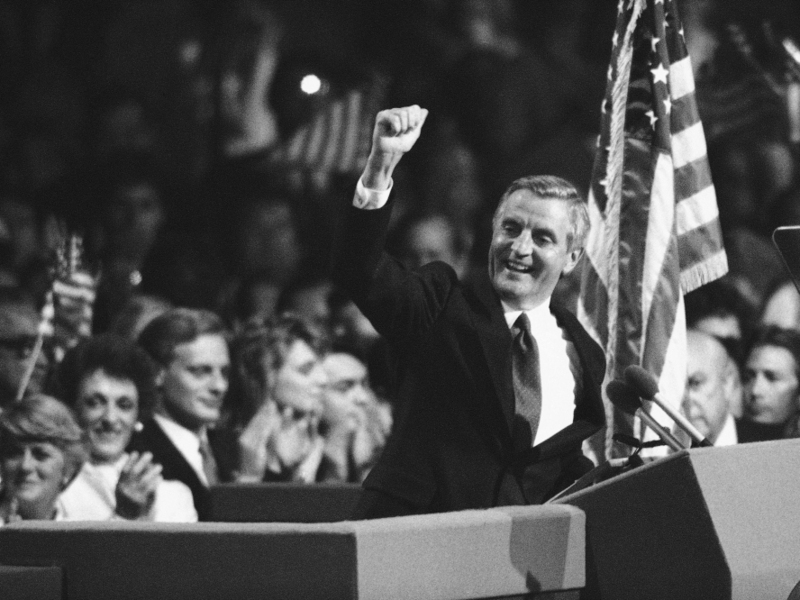 In deciding to cast himself as the truth-telling candidate for the 2012 Republican presidential nomination, Tim Pawlenty may have unwittingly placed himself in the position of being compared to another Minnesotan: Walter Mondale. It was Mondale, as you'll recall who, like Pawlenty, saw himself as delivering hard truths to voters in 1984. As a former vice president trying to deny a second term to President Ronald Reagan, Mondale made the never popular promise that, if elected president, he would raise taxes to close yawning budget deficits. Let's tell the truth. It must be done, it must be done. Mr. Reagan will raise taxes, and so will I. He won't tell you. I just did. Mondale credits that decision with allowing Reagan to politically annihilate him, with the 40th president winning every state except for Mondale's Minnesota. There was a lot of the spirit of Mondale in Pawlenty's announcement speech in Des Moines Monday once he got past his first "truth," hardly news to anyone, that "Washington is broken." The risks for Pawlenty of his chosen campaign message, however, are at least twofold. Voters say they like the idea of politicians telling them the truth. But as Mondale could attest to, that usually works better in theory than in real-word politics. Tell voters what they don't want to hear, that they must pay higher taxes or get significantly reduced benefits or services and a candidate who offers a less painful alternative will get their attention and often their votes. The other potential problem for Pawlenty is that saying you will be the truth candidate puts you in the box. It means he will be fact-checked more relentlessly than other candidates. Any sign of waffling or trimming or outright flip flops will immediately serve to undercut the image he's trying to create of being the most candid of the candidates. But just an hour after unburdening himself of these truths in Iowa, the candidate went on Rush Limbaugh's radio show and told a bit of a fib. Pawlenty was evidently distancing himself from earlier comments he made when he was running for governor that made him sound like a moderate Republican who believed government could indeed be too small and weak to effectively play its role in protecting the public interest. As he competes for the GOP nomination, Pawlenty obviously seeks to contrast himself against Mitt Romney whose reputation for shifting positions on issues has become a liability and President Obama who is deeply distrusted by many Republicans. But Pawlenty will be sorely tested, especially on the issue of taxes, an issue he largely avoided in his Monday announcement speech, except to say he cut them as governor of Minnesota. Another former Republican Minnesota governor, Arne Carlson, anticipated in a blog post that there would be a tax hole in Pawlenty's announcement speech, a sort of sin of omission. One thing is certain about Monday's Presidential announcement by former Governor Tim Pawlenty: he will not bring up the fact that he presided over one of the larger tax increases in Minnesota's history. Yes, that is quite correct. To which Pawlenty might say that he vowed to tell the truth, not necessarily the whole truth.